The problem isn’t actually the napping, but the waking up that is supposed to happen at the end of the nap. What is intended to be a 20-minute power nap inevitably turns into a two-hour deep sleep that leaves me feeling groggy and downright cranky for the rest of the day. When I share my problem with other people, they always offer tips and encouragement. “You can do it,” they say. “We believe in you,” they say. The thing is, I’ve tried everything and nothing seems to work. So I’ve decided to simply accept the fact that I’m not a napper. I just can’t nap. As tempting as it is, I have to resist my sofa’s siren call because I know that giving in and napping would turn me into a grumpy mess and I’m fairly sure that my students do not want to meet post-nap cranky monster Kalen. Just a guess. Good news, though: I’ve found a solution! 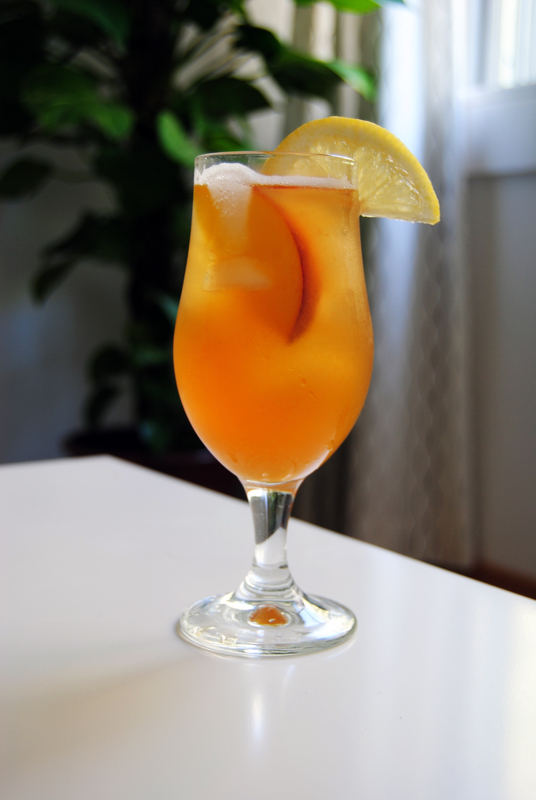 This fresh peach tea really does the trick. It’s cold, sweet and refreshing, and the perfect treat for a hot summer afternoon. Not only that, but it’s an effective, nap-free cure for my afternoon yawns. I recommend making a giant batch of this and leaving it in a pitcher in the fridge. It’s good for several days. Make it on a Monday and have it all week, or (even better) make it on the weekend and take it for a picnic or a day at the beach! One tip before you begin: Be careful with the sweetness of this tea. The first batch I made was far too sweet for my tastes, and I ended up diluting it with more black tea, thus losing some of the peachy goodness! No! To avoid such a tragic turn of events, I recommend adding small amounts of simple syrup to taste. Start with about ¼ – ½ cup and go from there. If your peaches are exceptionally sweet, I bet you could even get away with a sugar-free variety. I added basil on a whim because I had a lot of it, and the result was lovely. You could also add mint or whatever else suits your fancy. Play around with it! Fresh berries would also be a nice addition. Mmm, I bet you could even make a sun tea version of this. Oh, the possibilities! Pour boiling water over tea and basil leaves and let steep for 5-7 minutes. Set aside to cool. Puree the peaches in your blender or food processor (if necessary, add a bit of water to make this part a little easier). Pass the puree through a wire strainer to remove any remaining pieces. Add the puree to a large pitcher, along with lemon juice. Pour the chilled tea over the mixture and sweeten with simple syrup to taste. Serve with ice and slices of peach and/or lemon. Enjoy, preferably in a sunny spot.